This External hard drive is formatted in Exfax file. It support Windows 10, 7,8 and OS X (10.6.5 and newer). It also support PS4 and Xbox one ( need to format it on PS4 and Xbox one). If you connected a USB drive and Windows doesn't show up in the file manager, you should first check the Disk Management window. To open Disk Management on Windows 8 or 10, right-click the Start button and select "Disk Management". On Windows 7, press Windows+R to open the Run dialog, type diskmgmt.msc into it, and press Enter. 2. Now set the size of the new volume, and you're good to go! Note: if you need it for PS3 and smart TV, this external hard drive has to be reformatted in Fat32 file.. SLIM ALL-ALUMINUM ENGLOSUE KEEPS THE DRIVE RUNNING COOL AND QUIET.., FIT IN YOUR PALM. The sleek and protective metal finish is available in various colors. Toss it in your bag and you're good to go with storage and backup wherever you need to be. MULTI-FUNCTION USAGE, IT CAN BE USED AT EXTRA STORAGE DEVICE FOR COMPUTER, PS4 AND XBOX ONE. Use it with your ps4 and you can save game data and play movies, music and much more straight from the hard drive (need to format it on PS4/xbox one, it only take a few second. )The perfect extra storage solution for your Xbox one just plug it in and you have instant extra storage and can even install games directly to the external hard drive. 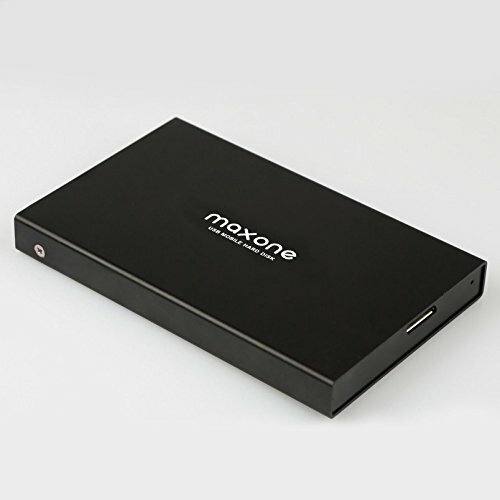 If you have any questions about this product by Maxone, contact us by completing and submitting the form below. If you are looking for a specif part number, please include it with your message.